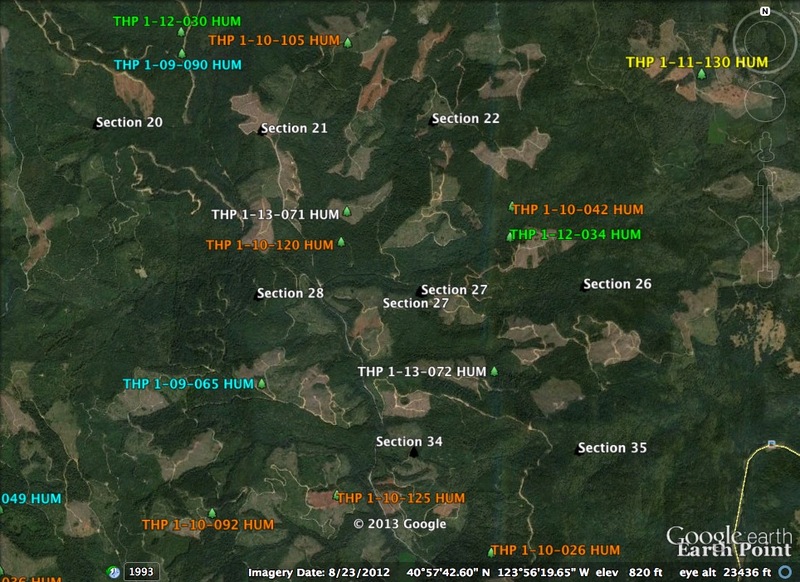 THPBlog: Green Diamond Resource Company planning a pair of clearcutting THPs near the North Fork of the Mad River. Green Diamond Resource Company planning a pair of clearcutting THPs near the North Fork of the Mad River. Both of the THPs listed below are adjacent to each other and drain into the North Fork of the Mad River, which flows into the Mad River and on to the Pacific Ocean. The Mad River contains steelhead, rainbow trout, and coastal cutthrout trout in the upper reaches, and is listed as impaired due to sediment, turbidity and temperature. There is a barrier to Coho and Chinook salmon 4 miles downstream of the THP areas. THP 1-13-071 HUM (K&K Combo THP) Green Diamond Resource Company, 226 acres; 40% clearcut, 34% commercial thinning, 20% selection, 6% no-harvest logging. Canyon Creek (HUM: T7N R2E Sec.20, 21, 22, 27, 28). Wet weather operations, moderate erosion hazard, slopes up to 40%, landslide terrain, road failure sites, 14 road drainage work sites, oversized units, herbicides, impaired 303.d watershed, coho watershed, 6 spotted owls within 1.3mi, trees up to 22” dbh. Estimated public comment deadline: 10/05/13. 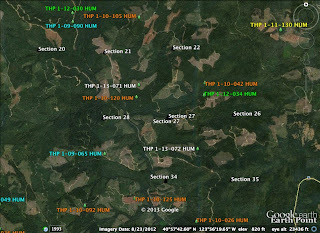 This THP is located about 8 miles NE of Arcata, CA at an elevation of 620 to 3,360 feet. Green Diamond Resource Company is planning a tractor and cable logging operation in second growth Douglas fir, redwood, grand fir and hemlock. The THP includes a large dormant earthflow in unit D, and in the NE portion of unit E, and some misc road related fill and cutbank failures. There are 14 road drainage work sites including rocking, dip construction, culvert repair/replacement, and road bed stabilization. Spotted owls are located within .25 mi of Units A, B, C and D. This THP is just to the north of Green Diamond Resource Company’s THP 1-13-072 HUM (K7K 170 14 THP). THP 1-13-072 HUM (K&K 170 14 THP) Green Diamond Resource Company, 116 acres; 76% clearcut, 19% selection, 2% roadside, 2% no-harvest logging. Canyon Creek, Long Prairie Creek, Denman Creek (HUM: T7N R2E Sec.26, 27, 34, 35). Wet weather operations, moderate erosion hazard, steep slopes up to 90%, landslide terrain in unit B, road failure sites, 9 road drainage work sites, impaired 303.d watershed, oversized unit a, herbicides, coho watershed, 4 spotted owls within 1.3mi, trees up to 60” dbh. Estimated public comment deadline: 10/05/13. This THP is located about 7 miles NE of Arcata, CA at an elevation of 840 to 2,080 feet. Green Diamond Resource Company is planning a mostly clearcut tractor and cable logging operation in second growth redwood, Douglas fir, grand fir and western hemlock. There is a road related landslide in the THP area which was caused by an oversteepened cutbank that failed and caused a debris slide. 13 deep-seated, shallow-rapid and small inner gorge landslides have been identified in and around Unit B. Green Diamond Resource Company is planning to use a landing to deck logs within a streamside area in unit C, and to construct 1,095 feet of new temporary road, and 2,596 feet of new seasonal road. 9 road drainage work sites are planned ncluding rocking, ditch cleaning, bank seep and road bed drainage and stabilization. There is a spotted owl nest within .5mi of Unit B. This THP is just to the south of Green Diamond Resource Company’s THP THP 1-13-071 HUM (K&K Combo THP). More information is available on the THP Tracking Center website.